This article goes through a complete 8D Analysis with our corrective action software, 8D Manager. I base this story on a true event with some changes to protect the actual actors. The company with the problem is Acme. 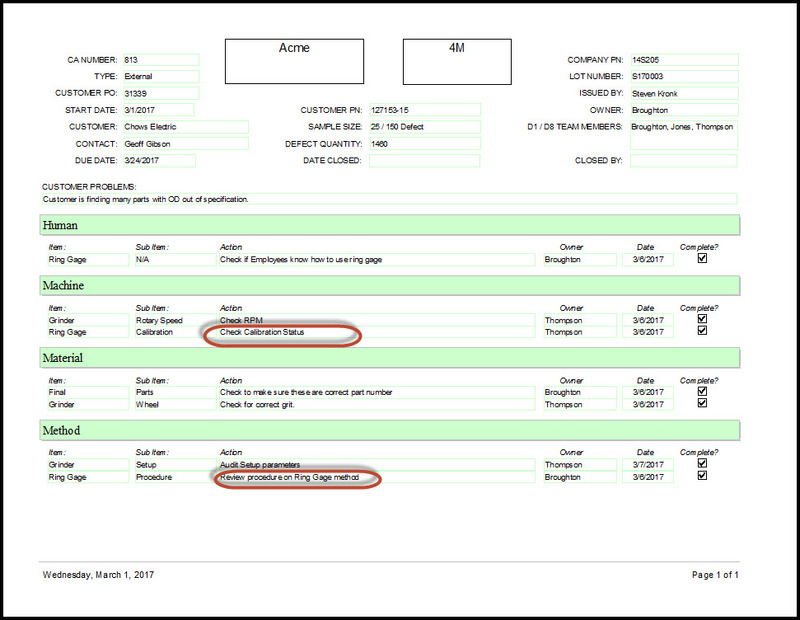 Acme uses 8D Manager on a regular basis for their corrective action software. “Dear Acme customer service, please be aware that we received lot S170003 on PO 31339 on 2/15/2017. We found 25 out of 150 parts with the OD out of specification. We cannot use the parts. Please issue a RMA for us to return the lot. We will need a full corrective action for this issue." This prompts customer service to start the corrective action process. They open 8D Manager and enter in the appropriate information. Customer service emails a corrective action report from 8D Manager to the Quality Manager, which lets him know about the customer complaint. Customer Service also replies back to the customer right away. Per this article, they ask for samples of the defect. They also asked for their inspection data. They provide Acme's FedEx shipping information so they can quickly get some samples of the defective parts. He then contacts Stockbase (finished goods department) to see if there are any remaining parts in stock from lot S170003. He opens 8D Manager and makes sure all information is correct. He shoots a quick email to the customer letting them know he received the complaint and currently researching the issue. In addition, he plans on providing a full 8D corrective action upon completion. Plus, he will update the customer upon any new findings. He then assigns team members. He includes the product manager. He sends the team members the above report which notifies them of the issue. Stockbase Manager. Opens 8D Manager find out the specific issue on lot S170003. She checks the inventory and finds no parts in stock. She records this action in 8D Manager. Because ACME wants to track all costs with regards to corrective action, the Stockbase Manager assigns a cost to this action. She figures it took 1 hour of time to check all of inventory for this lot number with a cost of $20 per hour. Going forward, ACME captures the costs for each action. This article will not further detail the cost for each action. It all works the same within 8D Manager as this image. Although not further discussed, 8D Manager lets you capture all corrective action costs and generates Pareto charts on the fly with different measurement filters such as date, customer, part number, codes and corrective action discipline type. Quality Manager. The next day, he receives the samples with the bad OD from Chows Electric. He witnesses the measurement of the OD and finds they measure out of specification. They measure too large. He records this in 8D Manager under section "D2 Company's Findings" which confirms the problem. He then verifies that there are no remaining parts in stock. He checks the MRP system and confirms 0 parts are listed for this lot. He also confirms Acme is not currently producing the part. He records this within 8D Manager corrective action software too. The verification prints like this (see below picture) on the 8D Manager Reports. Going forward with this case study, we will not cover other verification actions. If desired you can have a verification description for each action within 8D Manager. For each completed action, someone verifies the completeness of the action. Most customer just need a name and date. Some particular customers may want to specifically know how you verified the action. In either case, 8D Manager can handle it. Since the parts measured out of specification, the QA Manager issues a RMA (Return Material Authorization) to the customer so the customer can return the parts. He uses 8D Manager to issue the RMA to track the parts. He then emails the below RMA report to Receiving, alerting them of the incoming parts. Receiving / Shipping. Upon receipt of the parts they open 8D Manager and record the RMA as received. They then email the same above report back to QA Manager letting him know the customer returned the parts. The Team. The team starts the root cause investigation. They have a team meeting and conduct a 4M analysis. Here they list possible problems with human, method, machine and material. See below picture for the result of the 4M brainstorming analysis. Grinder: Wheel: Check for correct grit. 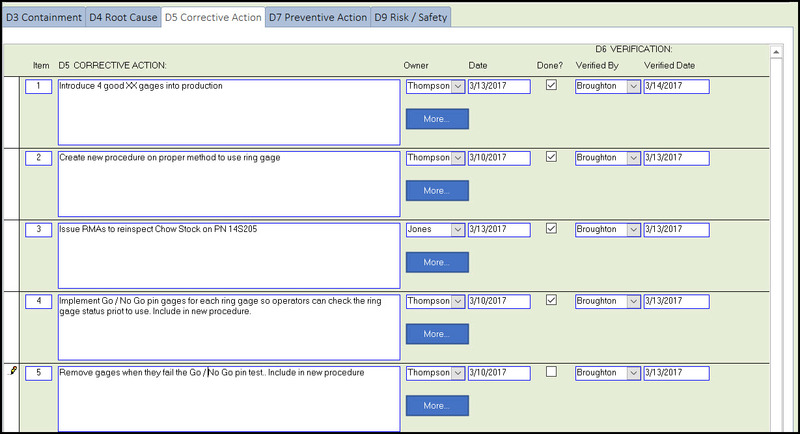 The 4M Analysis within 8D Manager corrective action software is a separate module. These root cause investigations do not show on the corrective action form, unless you want them too. The 4M provides a systematic approach to finding the root cause. The team prints the following report that shows the thought process on the 4M Analysis. If desired they can email this to the customer or whomever may need it. After the investigation of the 4M items, these two items were found to cause the problem. Ring Gauge: Calibration: Check calibration status. The Team further investigates the ring gauge calibration and finds the gauge used to check the OD on these parts is out of calibration. To further understand the issue, the team further completes a 5Y Analysis with 8D Manager corrective action software. The 5Y lets the team examine the deeper issue behind the root causes. Production was using a Go / No Go ring gauge that was out of calibration. The ring gauge was found to be worn. The ring gauge hole used to check the parts was too large. The ring gauge accepted bad parts. A new ring gauge properly rejected bad material. Because the parts were made of ceramic, the ring gauge wore over time with frequent use. This allow the ring gauge hole to get larger. The larger hole ring gauge accepted parts with large OD (above specification). No floor measurement standards available for production to assure ring gauge checked correctly. With these, the team captured and understands the root cause. 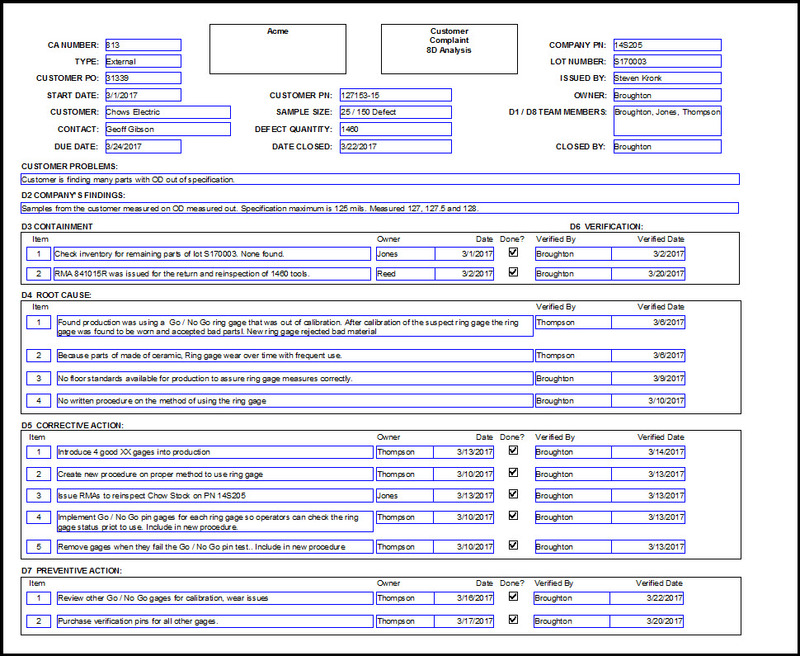 They copy these to the 8D Manager corrective action form with a click. The team then starts then assigns corrective actions to address the root causes. Introduce 4 good gauges into production and removed the bad gauge. Implement Go / No Go pin gauges for each ring gauge so operators can check the ring gauge status prior to use. Include these instructions in new procedure. Remove gauges when they fail the Go / No Go pin test. Include these instructions in new procedure. Below shows the data entered into 8D Manager corrective action software. These 5 corrective actions will eliminate and prevent the problem for Chows Electric. Next the team needs to examine Preventive Actions. Acme wants to make sure this problem doesn’t occur for other part numbers. Purchase verification Go / No Go pins for all other gauges. They entered these actions into 8D Manager. ACME also considered D9 Risk / Safety actions. They found no Safety issues. However, the cost of replacing the gauges due to wear could be an excessive cost risk issue. The team thinks that Acme could create their own inexpensive go / no go gauges in house. However, they will wait until the next Quality Management System review for input from others. The team enters this into 8D Manager corrective action software. He issues the 8D report to the customer. Below is the report. ACME uses the 9D report (not shown), which includes the Risk item, for internal purposes only. 8D Manager corrective action software lets you manage every step of corrective action process. It includes reports for simple corrective actions and complex corrective actions such as 8D and 9D. This article only touched upon only some of it’s great features.